With a stay at Scarborough Apartments in Scarborough, you'll be within a 10-minute drive of Scarborough Beach and City Beach. 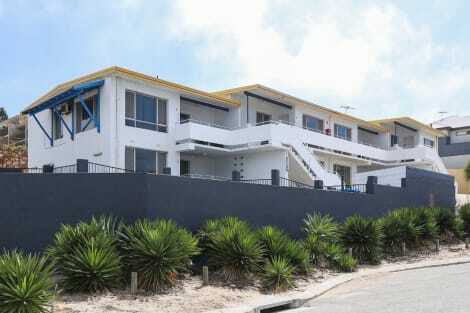 This hotel is 5.4 mi (8.7 km) from Hillarys Boat Harbour and 7.6 mi (12.2 km) from Cottesloe Beach. Take advantage of recreational opportunities offered, including a nightclub, an outdoor pool, and a spa tub. Additional amenities at this hotel include complimentary wireless Internet access, an arcade/game room, and barbecue grills. Sunmoon Boutique Resort Scarborough is located on Perth's beautiful Sunset Coast, home to some of Australia's best swimming and surfing beaches. Suited to both the business traveller and holiday maker, the resort offers a relaxed peaceful environment only 80 metres from the beach. Sunmoon offers an onsite restaurant and bar, secure parking, outdoor swimming pool, free in-house movies, function facilities, wireless internet and is only a short distance to shops and public transport. The Sunmoon Boutique Resort Scarborough offers an ideal location to experience Perth and its beaches whilst relaxing in comfort and style. Make yourself at home in one of the 38 air-conditioned rooms featuring refrigerators and microwaves. Rooms have private balconies or patios. Wired and wireless Internet access is complimentary, while 32-inch LCD televisions with cable programming provide entertainment. Private bathrooms with shower/tub combinations feature complimentary toiletries and hair dryers. lastminute.com has a fantastic range of hotels in Scarborough, with everything from cheap hotels to luxurious five star accommodation available. We like to live up to our last minute name so remember you can book any one of our excellent Scarborough hotels up until midnight and stay the same night.